A simply stylish pair of 9ct gold hexagonal creole earrings, crafted with an attractive diamond design. Perfect for effortless, everyday accessorising. 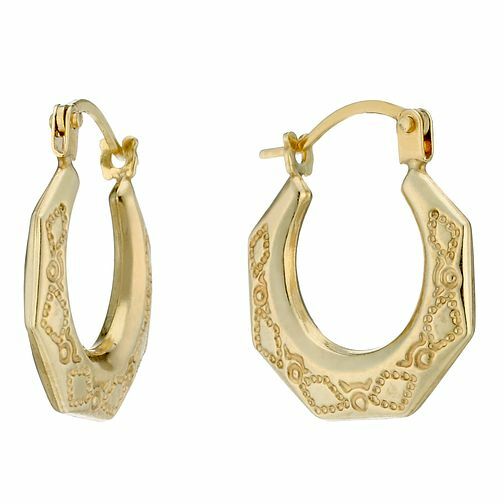 9ct Gold Diamond Pattern Hexagonal Creole Earrings is rated 4.0 out of 5 by 2. Rated 5 out of 5 by Anonymous from yes I loved these 9ct gold earrings. They are ideal for a child to wear on a special occasion and also for an adult to wear every day. The gift box was lovely and sturdy which makes the gift even more special. very happy !! !